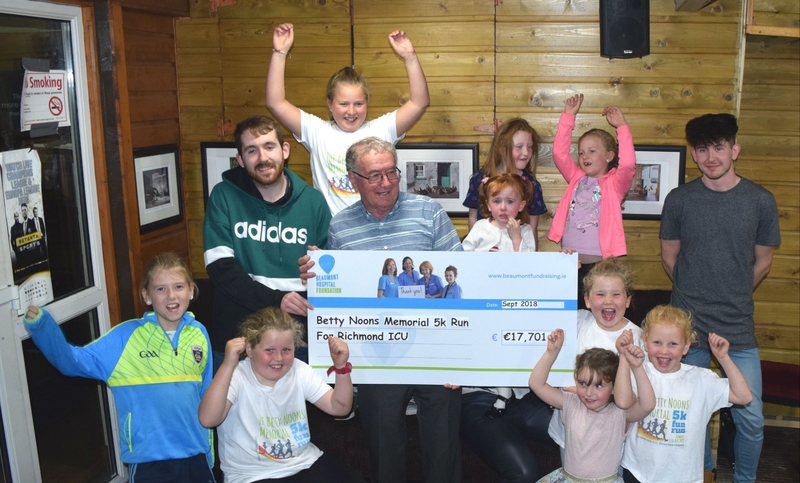 A cheque for a whopping €17,701.36 has been handed over to Beaumont Hospital, which was raised at the recent Betty Noons Memorial 5km Fun run in Monasterevin. Following on from what was a very successful fundraising event, the cheque was presented to Sheila Campbell, representative from Beaumont Hospital on Friday night September 14 by the Noons family from Mountrice. "The funds raised will contribute to the renovation of the family room in Richmond ICU. This room is of significant importance and huge benefit to family members whose loved ones are being cared for in the Richmond ICU Unit, which provides national neuro surgical care," said the family. "These facilities are essential for so many families who have to travel long distances. Again we have to emphasise that the staff and care given in Richmond ICU is amazing and this fundraising fun run was a small way of showing the Noons family's appreciation for the fantastic work that goes on there day in day out. "We would once again would like to thank each and every person who contributed in any way to this worthy cause, which is so close to our hearts. We can't thank you enough." Sheila Campbell, Fundraising and Communications Manager said; “Richmond ICU provides expert care to Beaumont Hospital’s sickest patients, all of whom require critical care post surgery or in fighting a major illness. And while they are in RICU, it’s of course a hugely worrying time for their loved ones who understandably want to maintain a constant reassuring presence for their family member. "The hospital accommodates families in staying overnight in the designated family room on the ward but this space needs significant renovation to improve the facilities and to generally upgrade the interior. I know that the Noons family spent time here themselves during Betty’s illness and is it very fitting that we will use the funds raised through the Betty Noons 5k Run for this project”.